Take a Deep Breath: You're not alone. 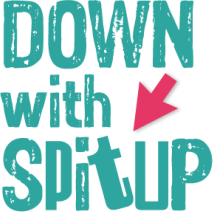 Nearly half of all babies do some spitting up or show some forms of reflux. You can tackle this! Schedule Sleep: Chances are your baby will not find rest and comfort easily. This means you'll have to work extra hard to take care of yourself. Find a friend to help you consistently have the chance to sleep, whether several hours overnight or naps during the day. Sleep and sleep training for your little one is a different challenge altogether. Get Confidence in Your Doc: You need to establish a good and confident relationship with your doctor. All doctors may be different, but you need to the find the one that's right for you and knows you and your baby. When in doubt, search a new one out. Check out and/or rule out issues like silent reflux, tongue-tie and lip-tie, MSPI and other allergies, teething or illness, and more. Medicate or Wait? At some point, either sooner or later, the question of medication will come up. The more you are educated and in-tune with your baby (and highly confident in your doctor - see #3) you'll be prepared to stand behind your choice. Watch Their Weight: It will be the major measuring stick to the spit up severity - no matter how much you think is staying in, what will matter is if the baby is gaining weight and thriving. 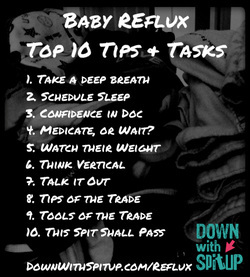 Think Vertical: To keep the spit up down, you'll find benefits to keeping your baby upright using a variety of methods. Take advantage of this time to bond with baby as you hold them close. Elevation for rest is also key; just make sure it's safe and supervised. Talk it Out: Talk to other moms and caregivers, past and present, and you'll soon find many others in your situation. It may be only revealed if you start the conversation, so don't hold your feelings in. Tricks of The Trade: Everyone has their own tricks and the Internet is full of advice from other moms and caregivers. Try, try, try to see what works for your and your baby. Stay on top of news and research. Tools of the Trade: There's also a whole market of products developed just for these types of conditions, such as gripe water. If budget permits, you may want to test out a product or two. This Spit Shall Pass: Some sources say babies can spit up well into their second year, and it still could be normal. If it doesn't seem to subside, you and your doctor will move to find the cause and set a new course for your child. Hang in there. BONUS TIP: Pay it forward. Though we're all in this together, every single situation is unique. From preemies to older to children, and from one solution to the next. We can all benefit from the sense of community created when families open up and share their stories.